Oue Werf, circa 1857, is on a working farm in the peaceful Schoemanshoek Valley in the Western Cape, 12 km from Oudtshoorn and 15 km from the Cango Caves. Each bedroom offers TV with MNet, bar fridge and tea tray and have private entrances to beautiful gardens, rich with birdlife. Romantic dinners and hearty breakfasts are served in the wagon house with a log fire in winter, or on the patio in summer. Deli, tea garden and light lunches. Relax at the gazebo and salt water pool. Absolute peace and tranquillity. Dam with raft and “foefieslide”. Stay for 2 nights anytime and get a free ostrich farm tour. Ts & Cs apply - contact our res team on res@portfoliocollction.com to make you booking. "My family and I stayed three nights at Oue Werf and found it to be a most beautiful and charming farm house. Family run, with a deep sense of history and most welcoming and accommodating hosts. The rooms are beautifully decorated in terms of the character of the farm and the food (both breakfast and dinner) was of the highest quality. We will certainly make this our destination of choice when stopping over in this area again. I highly recommend this as a place worth visiting. Brendan, Tracy and Robert"
"Extremely comfortable and Annelie and her staff were extremely competent and helpful. We had a marvellous couple of days"
"We had a wonderful 3 day stay at Oude Werf. 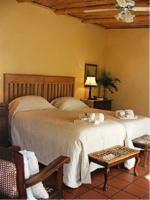 I can recommend this Guest House to all who would love to visit this region." "Well kept room, good twin beds, very helpful hosts, lovely atmosphere on the "farm". Perfect stay, we would like to come back." "We had a lovely stay and we're treated like friends, not strangers. We will definately go again, this time for longer!" Follow this road out of town. From the Cango Wildlife Ranch it is about 15 km to Oue Werf Country House (Schoemanshoek). You have to turn left at the Cango Ostrich Show Farm. You will be driving towards the Schoemanshoek church. On the right hand side - before the church you will see the Oue Werf sign. You will pass 3 traffic lights. Follow this road out of town. From the Cango Wildlife Ranch it is about 15 km to Oue Werf Country House (Schoemanshoek). S33° 28' 42.2" E22° 14' 32.4"